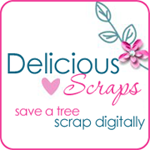 Delicious Scraps: Beautiful QPs by Tonisha! These are beautiful! Thanks for posting! I made sure to leave her some love, as well.